The Super lightweight aluminum construction of our competition grade battery hold downs are hands down the best on the market. Made with aircraft grade aluminum allows for strength and corrosive resistance compared to traditional hold downs. This battery hold down can be mounted to any flat surface in any position. Secure with two screws on each side. Great for boats, buggies, race cars and more. If you are looking to secure some extra power on your toy look no further. 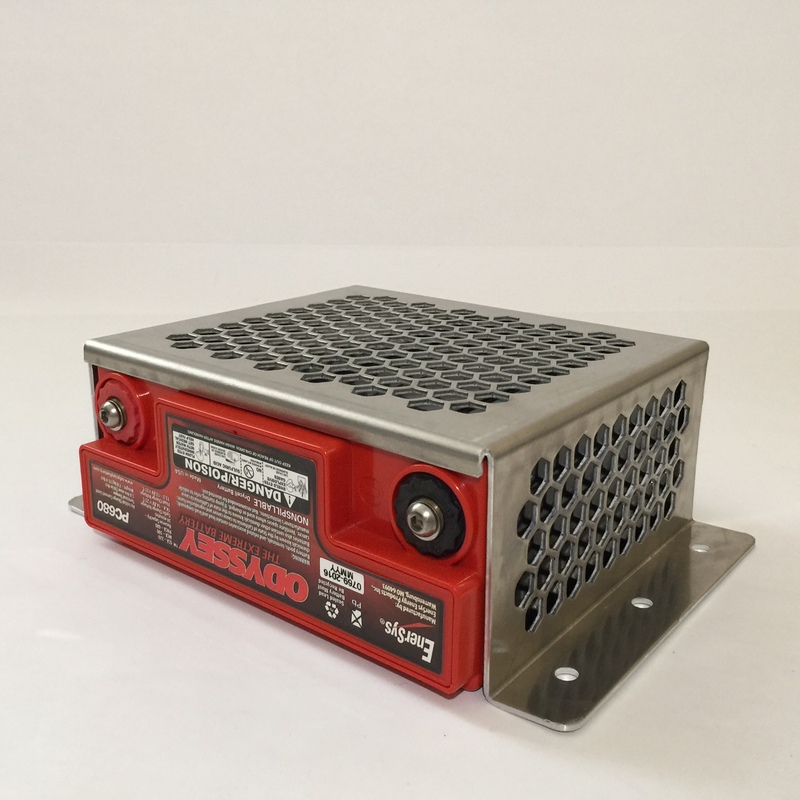 This competition grade and extreme light weight aluminum Odyssey PC680 Battery Hold Down is a completely custom design specifically for the Odyssey PC680 Drycell AGM Battery. One of the greatest features of the Odyssey line of batteries is they can be mounted in any orientation. Some applications and custom work requires solutions to unique problems. This PC680 hold down solves that problem. Great for tuner cars, trophy trucks, dune buggies, light aircraft, Go-Karts, runabouts, small race boats and so much more. The lightweight aluminum construction allows for corrosive resistances and reduced weight compared to traditional hold downs. This box that can be mounted to any flat surface in any position. Secure with two screws on each side. – Made In America – By Americans! Note:The Odyssey Battery shown in picture is not included. – And is for graphic image only. If you are looking for a great deal on a complete battery kit view our other items. Please feel free to contact us at (954) 675- 4068 or (772) 444-2280 should you have any questions or if you are having technical problems placing your order. The BatteryPete Team is standing by to help you! Be the first to review “Odyssey PC680 Battery Hold Down Competition” Click here to cancel reply.